Results: A new, improved computational model that describes the structure and dynamics of water molecules in both small assemblies and the liquid has been developed at Pacific Northwest National Laboratory by Dr. Sotiris Xantheas and Dr. George Fanourgakis. Known as TTM3-F, the new model represents a significant improvement over currently available ones by providing a better description of the interactions and the spectroscopic signatures of water molecules in different environments. Why it matters: Understanding water at the molecular level is essential to advancing frontiers in such areas as aqueous chemistry, hydrogen generation and storage, and the transport of contaminants in surface and subsurface environments. "Until now, no model could as fully describe the vibrations of water molecules, from a single water molecule and small water clusters, to liquid water, ice and clathrate hydrates," Xantheas said. Methods: Liquid water consists of molecules held together by hydrogen bonds. That bonding network influences the physical and chemical properties of water in solution, in reaction with other substances, and as a medium for the transport of various materials. Infrared spectroscopy records the "fingerprints" of the underlying hydrogen-bonding network as bands in the vibrational spectra indicating the particular motions of atoms. This knowledge enables scientists to better understand the local structure of water in various forms and environments and improve models by including better physics. Because experiments do not provide direct information about which bands correspond to a particular structure, computer simulations that employ accurate potentials ("maps" of where atoms could possibly go) are used to make this assignment. The scientists used the results of high-level electronic structure calculations on water clusters performed previously at two institutions to frame the new model. The results came from the Department of Energy's Environmental Molecular Sciences Laboratory, a national scientific user facility at PNNL, and the National Energy Research Scientific Computer Center at Lawrence Berkeley National Laboratory. To model the vibrational spectra, the researchers incorporated the novel idea that interaction with the surrounding water molecules makes the dipole moment (the location of a molecule's positive or negative charge) of a single water molecule in a condensed phase environment qualitatively and quantitatively different than the corresponding dipole moment in the gas phase. 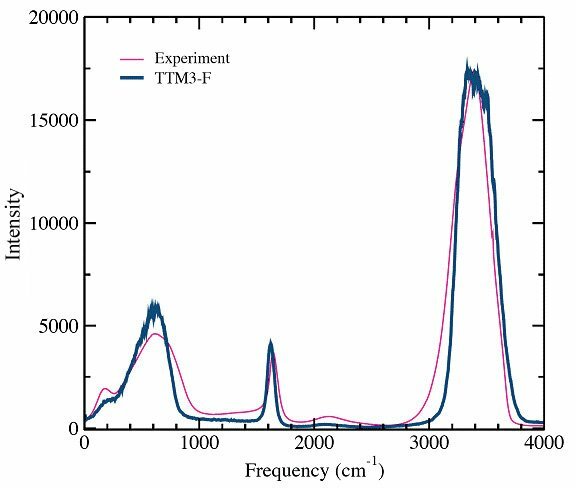 Inclusion of this information in TTM3-F enabled better alignment with the observed infrared spectra. The team then tested the new model by measuring the average structure and other thermodynamic and transport properties of liquid water. The close agreement of the results of the simulation with the experimental ones validated the model's effectiveness. What's next? The researchers are enhancing TTM3-F to include the interactions of water with positive or negative ions of lithium, sodium, fluorine, chlorine and other elements, as well as to further study the structure and spectroscopic features of aqueous interfaces. Recipient of a reintegration grant from the European Union, Fanourgakis is now with the Institute for Electronic Structure and Laser at the University of Crete, Greece, and continues to participate in the water model collaboration. Acknowledgments: This work was supported by the Division of Chemical Sciences, Geosciences and Biosciences, Office of Basic Energy Sciences, US Department of Energy. Citation: Fanourgakis GS and SS Xantheas. 2008. "Development of transferable interaction potentials for water. V. Extension of the flexible, polarizable, Thole-type model potential (TTM3-F, v. 3.0) to describe the vibrational spectra of water clusters and liquid water," Journal of Chemical Physics 128, 074506.